Large garages don’t come much more attractive than this one, and its traditional timber design is sure to impress your friends and neighbours. 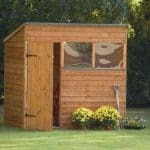 It’s not only well designed, it’s very spacious too, which is why we can imagine it being used as a large garden shed or even a workshop, as well as being an ideal storage space for most sizes of vehicle. Once inside, it’s surprising just how much room there is, and this is largely thanks to the apex roof. Not only does it keep rainwater away, therefore keeping the contents dry, it also creates a ridge and eaves height that are taller than most that we see. There’s also lots of light and air inside, thanks to the three windows – one of which can be opened to provide ventilation. The overall effect is an interior environment that’s pleasant to spend time in. The apex roof at the summit isn’t the only element of this garage that’s good at keeping rain out, as this function is also carried out very effectively by the tongue and groove cladding. We were impressed by just how tough and strong it was, and the superior fabrication of it giving a planed all round appearance. 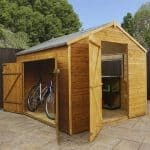 We review garages made from all varieties of substrate: timber, metal, plastic. This, however, has to be one of the most attractive designs that we’ve seen and it caught our eye at first sight. 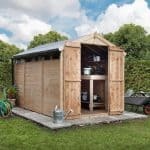 We like the fact that it takes the very traditional design associated with a wooden garden shed, and by expanding it to very generous dimensions creates a structure that’s ideal for use as either a garage or a workshop. The overall storage volume is significantly boosted by the high apex roof. Clad in mineral felt on top of tongue and groove timbers, it’s very effective at stopping water penetration, and it also gives a ridge height of 2.74m and an eaves height of 1.85m. This nine foot ridge height is as tall as any that we see, and the overall width and depth, measured at 3.66m and 4.88m respectively, also create lots of space for either a vehicle or tools and machinery. We were very pleased to see that PAR tongue and groove cladding had been used throughout this building, as it means that it remains lightweight whilst also being unusually strong and resilient. It’s 12mm thick, and is backed up by a heavy duty frame measuring 44 x 44mm, creating stability that can be relied upon. Whilst there is no floor, which is just as we’d expect from a garage, there is a timber support rail so that sound insulating boards can be installed if required. 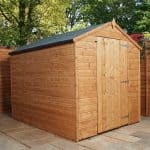 With such high quality cladding used, we expected to find a ten or fifteen year warranty against tor offered as we see on many other timber garages we review. Disappointingly, however, only a basic one year statutory guarantee is provided here. We feel this shows the inefficacy of the initial dip treatment used, as does the requirement for owners to add their own preservative coatings just six weeks after installation and every year after that. With a building as large as this, that can add up to a lot of wood preserver being used and therefore a lot of time and money being spent as well. We were pleased to find that a single hinged access door is provided at the side, which side it’s positioned on being down to the owner, as this adds flexibility and convenience. The double hinged doors that provide the main entrance share the same height as the single door, a very generous 1.88m, and are also very wide at 2.13m. We were just as impressed by the window provision as we were by the doors, with three being included in a single bank. Garages and workshops can both become hot and humid environments, so we were pleased to see that one of the windows is opening and can therefore be used to allow cooling air in. If required, there’s also an option to convert one of the two fixed windows into another opening window for even greater ventilation capabilities. Whether it’s holding a car, van, or expensive machinery and equipment, the owner will want this building to be as secure as possible. That’s why it was disappointing to see that no padlocks, or alternative locking system, had been provided, even though both the double and single doors are padlockable. A set of padlocks should therefore be the first priority for anyone buying this garage. On a more positive note, the windows themselves are made of tough horticultural glass that can be hard to break, and there’s also an option to have a window free design, with all the benefits that brings, at no extra cost. As well as the extra opening window and the fully boarded options mentioned earlier, there’s one other optional purchase, and it’s one that we feel many customers will find very useful. 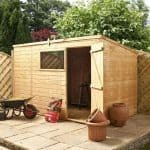 We’re used to installing sheds and garages, of course, but we appreciate that many people are less experienced in this area and so may find the prospect of having to assemble such a large timber building themselves daunting. That’s why it was good to see that a professional installation service is available, even though it costs an extra £269.99. We not only found PAR cladding used, but also that the frame had chamfered, or rounded, edges. This gives extra strength where it’s needed most, and also shows the high quality manufacturing. This garage has the potential to be very long lasting, but we feel that’s too reliant upon the owner keeping to what can be a time consuming treatment schedule. 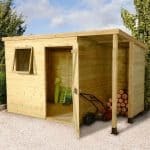 There are larger timber garages that we’ve reviewed, but even so this should have enough storage space for most domestic users. As you may expect with a timber building of this size, there are a lot of parts to put together. We recommend that two people allow at least two days for the task. At a price in excess of two thousand pounds we would have expected to see a locking system included, and a long lasting pressure treatment used. Nonetheless, for its size this still represents adequate value for money. 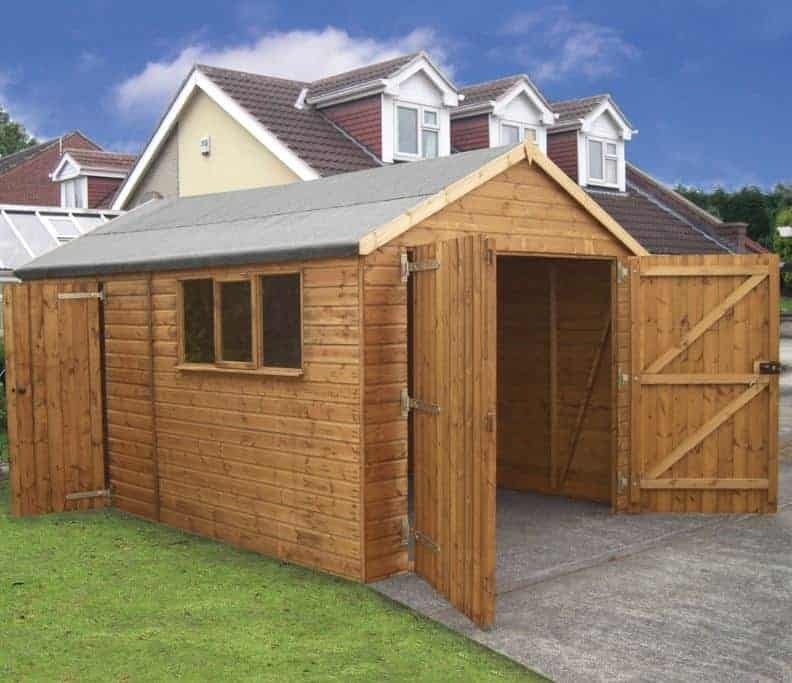 Final Thoughts: If you want a large timber garage that can also be used as a garden shed or workshop when the car’s not inside, then this is a building that you should consider. There’s even vertical storage space available when a vehicle is inside, thanks to the very tall ridge and eaves heights. With so many people living busy lives, we were impressed by the option of the professional installation service, ensuring that customers get a perfect assembly without having to spend two days, and a lot of physical effort, on the task. We also liked the option of turning it into a secure window free environment that nobody can see into, although locks and an alarm will need to be added for all round security.